Previous pampering experiences will pale quickly after a stay at this Caribbean retreat, with its sleek French flair. Leave it to the French to mastermind an escape so decadent, so completely given over to the good life that it leaves an impression of well-being long after returning home. Belmond La Samanna is just that sort of place, a luscious multi-course feast that blends French savoir-faire with Caribbean soul and spirit. It begins with delicious morning coffee on a private seaside terrace, continues with an achingly good deep-tissue massage in one of Elysées Spa's outdoor treatment rooms (feel the breeze! 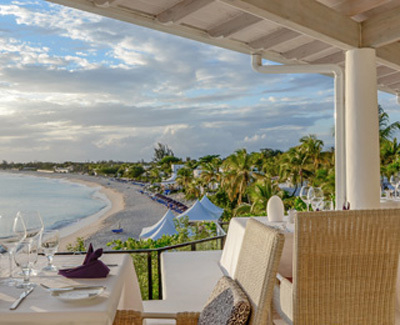 ), moves on to relaxation or recreation on the resort's secluded sliver of white-sand beach, and winds up with gourmet cuisine and world-class wines perfectly served with an ocean view. Inspired by the sunny, whitewashed houses of the Greek Isles, each guest room, suite, and villa at La Samanna is bathed in natural light and splashed with the colors of sea and sky and tropical flowers. Furnishings are crafted from wicker, bamboo, and Caribbean hardwoods like teak and mahogany. All have air-conditioning, ceiling fans, and a private terrace or patio from which to view that amazingly turquoise sea just beyond. For the ultimate indulgence, some suites have outdoor showers in lush tropical gardens, or sunny terraces with refreshing plunge pools. Others have petite kitchens with fridges for stocking that all-important champagne and caviar. Whether honeymooning or simply rekindling the romance, guests will find the Belmond La Samanna staff dedicated to discreet service with understated elegance. And all this luxury is only 15 minutes from the capital of Marigot, with its tony shops and boutiques, or a quick jaunt to the renowned gourmet restaurants of Grand Case.